Winter is now with us most outdoor pools are have been covered for the winter. Some customers wait until the leaves have all fallen. Close your pool use some shock chlorine to kill any living matter before adding the NomoreAlgae. We have plenty of fresh liquid chlorine, Superfast Shock and our NoMoreAlgae. The shop is now closed on Sunday mornings as clocks already changed for British Wintertime. The Water Balance should be checked and adjusted as necessary. Another wet winter may have cause the Calcium Hardness and Total Alkalinity levels to become depleted unless a substantial amount of fresh tap water is added when opening your pool. A water sample will be required if you want us to check the balance for you. We can offer a full Balance check, plus “Total Dissolved Solids” and a report using the Spin Photometer for just £5. The long awaited update for the Spin has now arrived with improved accuracy as well as testing for phosphates. (Food for Algae) A quick check (non Spin test )is still free which is strongly recommended if you are just opening or closing your pool and not sure where to begin. Again a water sample will be required. We know several independent pool engineers who can professionally open and close your pool as well as carrying out maintenance tasks, sand and liner changes etc, for you as required at realistic prices. Our Liquid chlorine shock is a great product to use on patios and paths. Start with a 50/50 solution in a plastic watering can. Can normally dilute further if stains not too stubborn. Use stiff brush and leave a quarter of an hour or so and rinse area. Be careful if rinsing with a pressure washer as grouting maybe dislodged. Very Important! Wear old clothes, no matter how careful you are tiny splashes will ruin your cloths. Eye protection (goggles) also recommended. Good idea to use up old product for this purpose leaving the fresh supply for the pool. We can’t believe we have been using our old Waterlink express photometer for 20 years now. It was “state of the art” at the time but now this latest updated version offers much greater potential accuracy in less than half the time. The same 8 tests are are carried out plus phosphates using just one disc. Cyanuric Acid, Copper and Iron - chlorine stabiliser and metals. Use this product to keep your pool clear all Winter. First check pH adding some pH reducer if over 7.5. Shock pool with liquid chorine or Superfast Shock and brush walls and floor. If chlorine level is around 10ppm 24 hours later then add NoMoreAlgae. If pH was over 7.8 then more pH reducer will probably be required. Note that high chlorine levels can interfere with pH readings so wait until chlorine readings are less than 10ppm. Very wet weather may have lowered the overall water balance on outdoor pools making the water more aggressive - see below. 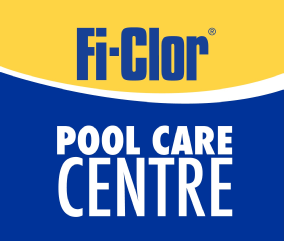 We are pleased to have been stocking the new Fi-Clor Premium 6 chlorine tablets exclusive to Fi-Clor Pool Care Centres. Only available in 5Kg pack size, these new 250 gramme tablets will give your pool sand filter a boost each time new tablets are added. Feedback so far has been very positive, these tablets are making pool maintenance easier and results even better! Same price as original 5Kg Premium 5 Tablets, the choice is yours! Feedback received from users so far has been very encouraging! We have a limited number of these super efficient pumps in stock at the very special price of £750. New more efficient permanent magnet motors run much cooler. The slower running speeds use much less electricity for slightly reduced water flow. Ideally needs a 24” filter with 1HP pump (¾HP min) to make real savings. This pump is a must if you have a Heat Pump or run pump 24 hours a day.